New York, NY – Cre8tive YouTH*ink, in collaboration with the Quinlan Development Group and Lonicera Partners, is pleased to announce the completion of “The Art School Without Walls, Vol. 6,” featuring street artists Chris Stain and Billy Mode, a project providing creative arts mentorship to 15 inner-city youths (ages 15 – 22) in a two-month-long mural workshop. The group’s work ultimately resulted in a large-scale (45’ x 80’) permanent site-specific mural titled Sign Language. The image was inspired by a photo from Martha Cooper’s – “Street Play Project” (1978), her eloquent photo series that poignantly captures the resiliency of inner-city youths amid the bleak backdrop of a blighted 1970s New York City. 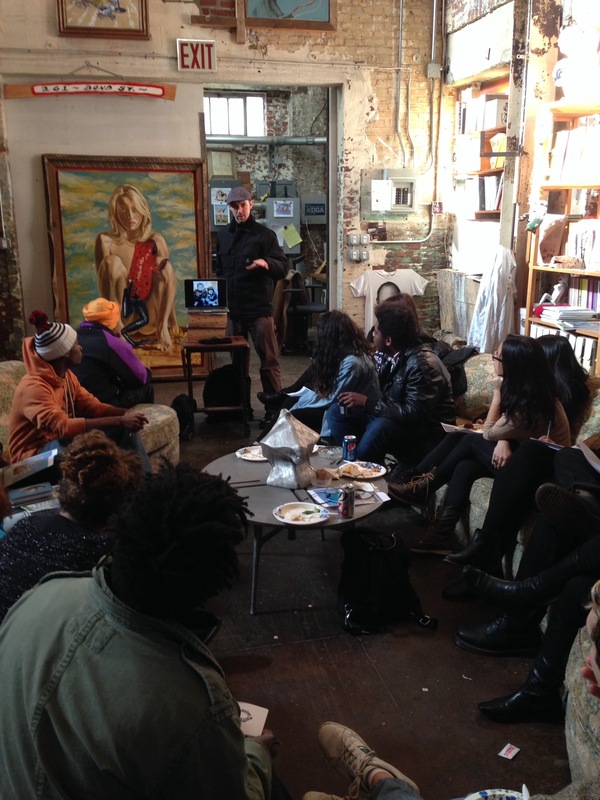 Street artists Chris Stain and Billy Mode led a group of apprentice artists through all aspects of mural making – engaging them in the process of planning and producing a large-scale public art project. Pre-production meetings took place at the Ray Smith Studio in Gowanus, Brooklyn. Production took place at the group’s temporary headquarters, a large studio in the Industry City Complex located in Sunset Park, Brooklyn. During the course of eight weeks, the group used a variety of media to prepare the one hundred 4’ x 8’ “Hardie Board” composite panels that make up the mural. Once completed, the panels were permanently installed by the skilled craftsmen of the Janbar Construction Company onto the exterior wall of a new residential building located at 267 Pacific Street in the Boerum Hill Section of Brooklyn. The building is currently being developed by The Quinlan Development Group and Lonicera Partners. In addition to the visual arts apprentices involved in the making of the mural, this project also featured three social media apprentices who documented the mural’s progress. The social media group Instagrammed and Facebooked the project’s progress – and generated a total of 11 blog posts for the Niborama creative arts blog. Check out the Cre8tive YouTH*ink youth arts blog coordinated by Robin Cembalest, at Niborama.com. All of the apprentice artists received stipends and Metrocards to defray living costs during the project. They were also provided breakfast, lunch and an afternoon snack on their scheduled workdays. Food service was provided by Ninja Bubble Tea who kept the crew well fed throughout the project and the bubble tea flowing. Materials used to paint the mural panels included Sherwin-Williams exterior latex and Montana 94 spray paints with Sherwin-Williams Sher-Clear acrylic industrial marine clear overcoat for protection from the elements. Stain grew up in Baltimore and was introduced to art through graffiti – via books like Subway Art (see Martha Cooper below) and movies like Wild Style, Style Wars, Beat Street, and rap records that featured graffiti lettering on their covers. Starting with the printmaking he learned in high school, Stain later adapted the stenciling techniques for which he has now become well known. Reminiscent of the American Social Realist movement of the 1930s and 40s, his large-scale stencil street art aims to dignify the struggles of unrecognized and underrepresented people in society. Billy Mode is a Baltimore artist who credits his personal style to his early training in 1980s graffiti movement. His other influences include sacred geometry, micro/macrocosm parallels, and designs that exist in nature. Mode fuses these concepts together with words and phrases from songs and conversations to create mathematically influenced modular structures that communicate thought provoking messages. Martha Cooper is a documentary photographer who has specialized in shooting urban vernacular art and architecture for over 30 years. Cooper is a major documentarian of the graffiti and street art movements. Born in Baltimore, she earned an art degree from Grinnell College, joined the Peace Corps and taught English in Thailand before motorcycling from Bangkok to London – going on to earn a degree in ethnology from Oxford. She then settled in Manhattan, where she worked as a staff photographer for the New York Post in the 1970s. Her seminal book Subway Art has been hailed the “Graffiti Bible,” but it is her photo essay book Street Play (2005) that best reflects her commitment to capturing the scrappiness and creativity with which inner-city kids make the best of their surroundings. It’s this spirit of creativity and aspiration that is reflected in the Art School Without Walls.